At first I thought, this upcoming movie "The Gift" starring Jason Bateman, Rebecca Hall, and Joel Edgerton is just another suspense/thriller/horror movie like that of "The Others", "The Babadook", "Drag Me To Hell", or perhaps "The Sixth Sense" where the theme/genre is dark, and there are ghosts/evil elements somewhere in the movie that really scares the hell out of you, and there will be lots of killings and bloodsheds, but I was wrong to judge the movie at first. 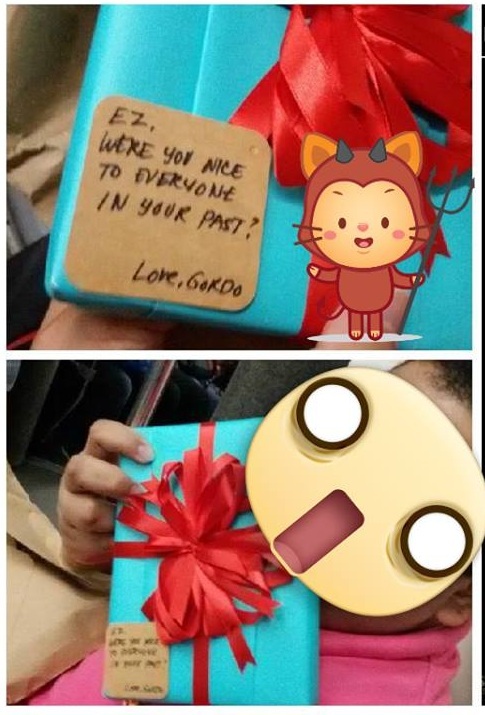 "The Gift's" scared tactics started when I received two special gifts from Gordo. Actually, the studio that is going to release the movie sent me and some of the bloggers I know, some gifts that made you think Gordo is really a sick psycho person with a troubled mind. As you can see, the gift (below) is also personalized as if Gordo knew me very well. But don't worry because the gifts were part of the promotional campaign of OctoArts Films International, the studio that will release the film, to give the audiences a feel of what to expect in the movie. *This is where the past becomes the present. Do you dare to click? Believe me, it works because prior to the screening that we attended for "The Gift" movie, I was really scared with it, especially when I opened and was surprised of the item inside. I will not tell them because it might give a spoiler about the film! I'll just leave that one aside for some really thought-provoking expectations about the movie. Anyway, the one below is one of the gifts I received from Gordo. Kinda sick, right? Honestly, it was scary but fun and truly a mind-boggling and scary experience. It's fun receiving gifts from people you don't even know, but it's a mind-boggling and scary experience receiving gifts from, yes, people you don't even know. The gifts experience is truly a remarkable and amazing promotional marketing idea! I simply loved it! Now, let's get into action and start this "The Gift" movie review! The movie "The Gift" is the directorial debut of the Joel Edgerton, also the actor who played Gordo, so this film must be very special to him because I can see his whole heart pouring out all throughout the entirety of the movie. His personal touches to the movie made this psycho-thriller a run away winner to all the psycho-thriller movies that was made in the past. The movie is an intelligent and heart-pounding thriller movie. *Gordo asks: How well do you know your spouse? The moment I realized that I was really hooked on this film was when I got affected with each of the characters. The plot, the drug addiction, the bullying -- everything stuck into mind as we, the audience felt the thriller that was the movie. All I can say is that, the plot in the movie CAN happen in real life! The stress level that this movie gave me even surpassed the "stress expectation" that I felt when I watched "Drag Me To Hell". That graveyard scene and the last scene from "Drag Me To Hell" really brought the scare out of me. But this movie (The Gift) is a bit different. You know there is evil somewhere, but once you get to the point where climax of the film is slowly revealing, you will pity the villain and will have a change of heart. Believe it or not, I cursed more than twice as I am watching "The Gift" movie! I highly recommend this movie for people who loved to be scared but with a strong heart! The clarity of message surely transcended from the big screen and through the viewers' mind. This movie has affected a lot of people right hit on target! And that includes myself. Showing on August 19, 2015! We will give "The Gift" movie a 9/10 star ratings because we were entertained, freaked, died a little inside, scared, and provoked! Mixed emotions, total experience! 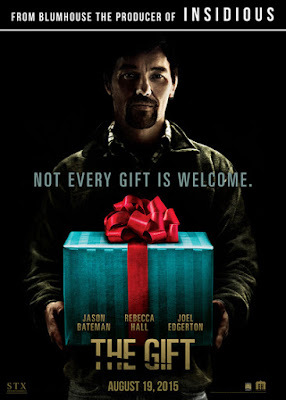 Watch "The Gift" full movie trailer below.